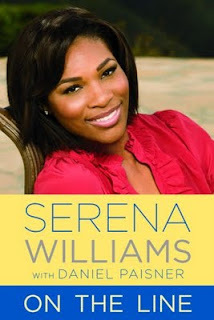 BETWEEN winning grand slams and acting and fashion designing, Serena Williams has inexplicably found the time to do something that millions of Americans only dream about: She’s penned a book. “OTL” is written in an accessible, conversational style. It is not serious penmanship by any stretch – nor is that the intention. It is what it is: engaging; funny; tender; inspirational; sad; lighthearted, with some beefs, but not too many – and not too deep. Some chapters (No. 3) like “Venus and “Me” are almost self-explanatory, while others like “Ride a Little, Bump a Little” (No. 1), about her early tennis-playing days when the game was a family affair, are more cryptic. She serves up a little controversy in Chapter 4, “The Fiery Darts of Indian Wells,” about that ugly incident in 2001 at the California tournament (now known as BNP Paribas Open.) On the lighter side is “Fashion Statements" (Chapter 7), which does not so much concern itself with soccer get-ups, catsuits, tiaras and denim skirts, as it does with the fashion design education of SW.
"On the Line" is published by Grand Central Publishing, a division of Hachette Book Group.